Just saw the ISS pass over Annapolis, Maryland. How fabulous to know there are people inside that little point of light. Thank you for your work and for being the pioneers that you are. Ideally, you guys should run on this treadmill while lifting with your arms another person’s sprung weight, like the porters of a sedan chair, in addition to the back packs sprung weight (which represents your own weight). 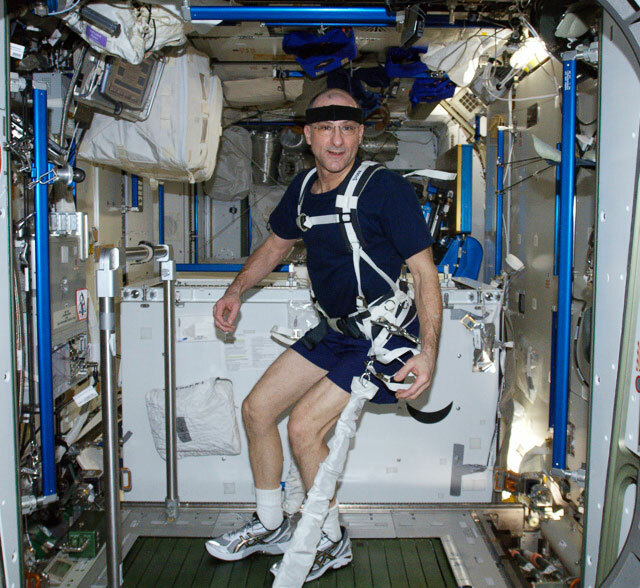 This would effectively double the load-bearing forces, rendering a more effective muscle-toning exercise, as well as involving the arms, which suffer greatly during an extended space mission. Similarly, the head band could also be equipped with a gentle spring pushing down from the ceiling to tone the neck muscles during the run. By engaging a full compliment of muscles, the astronaut is better prepared to return to earth, and knows it, making them feel emotionally better prepared as well. This is essential to the emotional as well as physical well-being of all medium to long term space visitors. This is particularly important as we move towards not just groups of astronauts but individuals as well who acquire vital long term experience in space, and results in insights as yet untouched by the human mind.